Ryan Giggs is not under consideration to become Manchester United's next full-time boss as the club begin their search for a successor to David Moyes. Giggs, 40, has been put in temporary charge after Moyes was sacked following just 10 months in the job. But the Premier League club feel an experienced manager is needed to turn things round after this season's slump. Gary Lineker thinks United are "in crisis" after their worst season since the Premier League began. "They have not qualified for the Champions League and are in a worse situation than 12 months ago," said the BBC Match of the Day presenter and former England captain. "Then they had lost their manager. This time they don't even know whether they are going to be in European football next season." Former Manchester United captain Roy Keane, speaking to ITV Sport, said Moyes should have been given more time and accused the players of letting the manager down. "Some of the players should be ashamed of themselves," he said. "To be seventh is disappointing - and he will take responsibility for that - but I don't think he's had that support he needed and he deserved more time." Chelsea boss Jose Mourinho, talking before the club's Champions League semi-final first-leg at Atletico Madrid, added: "I just feel sorry for David, like I feel sorry for every manager that loses his job." Robbie Savage, who was in the United youth ranks with Giggs and was also a team-mate with Wales, says the club need an experienced head as they look to rebuild their squad over the summer. "In the future, Ryan can be a successful manager," Savage told BBC Sport. "But going forward it's such a huge transfer window for United that they need an experienced man at the helm. "Keeping Ryan as assistant manager would be a great idea. He has United in his blood and has won countless trophies. "He would be able to learn the ropes from a manager who has won trophies and been there and done it." 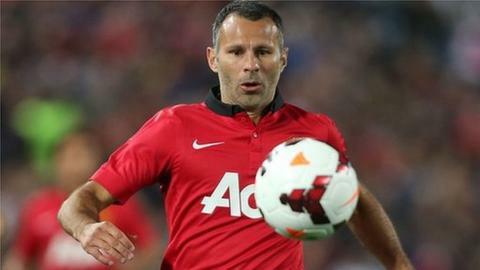 Giggs, the most decorated player in English football, has yet to decide whether to continue his playing career. After winning 13 Premier League titles and the Champions League twice with United, as well as the FA Cup four times and the League Cup three times, his current contract runs out at the end of the season. It is understood United's hierarchy reached their decision to dispense with Moyes reluctantly but also in the knowledge they had little alternative. They were forced to bring forward a public announcement when British newspapers began reporting the 50-year-old Scot's tenure was set to end. Sunday's 2-0 defeat at Everton means United, currently seventh in the Premier League, will miss out on the Champions League for the first time in 18 years. It would also now take a favourable sequence of results for them to secure a place in the Europa League. Poor results are not the only factor to count against Moyes, who was sacked a year to the day after United were crowned champions. United officials hope Giggs will be able to restore a sense of bullishness to the club, as well as a return to the positivity and attacking philosophy for which the club are so well known. As the search for a second manager in less than a year begins, Jurgen Klopp and Pep Guardiola appear to be out of reach. Klopp says his contract with Borussia Dortmund is "unbreakable", while Guardiola has guided Bayern to the Bundesliga title and Champions League semi-finals in his first season in charge. It leaves Netherlands coach Louis van Gaal in a strong position, given Carlo Ancelotti is under contract at Real Madrid and both Diego Simeone and former United defender Laurent Blanc, presently at Atletico Madrid and Paris St-Germain respectively, have never coached in England. Van Gaal's managerial curriculum vitae is impressive. The 62-year-old won three Dutch titles with Ajax between 1991-97, as well as the 1995 Champions League. He then secured two La Liga crowns at Barcelona and enjoyed Bundesliga success at Bayern Munich in 2010. Savage believes he would be the perfect fit for United and has a great relationship with striker Robin van Persie. "If Manchester United don't invest heavily in the next transfer window, then they will go backwards," added the former Leicester City, Birmingham City, Blackburn Rovers and Derby County midfielder. "Van Gaal is a fantastic manager who has been there and done it and will command respect." Former United goalkeeper Raimond van der Gouw says Van Gaal has an impressive pedigree. "He has proved he's a good manager," Van der Gouw told BBC Radio 5 live. "He's a champion in Holland, Germany and Spain. He can be a good manager for United." Van der Gouw also insisted Moyes was always likely to find it hard making an impact at Old Trafford. "If you have to go to a big club like United, you need experience," he said. "It's a big step to go from Everton to Manchester United. It's a much bigger club, much more responsibility." Former Manchester United manager Wilf McGuinness succeeded Sir Matt Busby in June 1969, taking over in similar circumstances to Moyes when his predecessor moved upstairs. McGuinness reached three cup semi-finals, but failed to win any silverware and was sacked in December 1970. "Everybody hopes to go to clubs like Manchester United and stay the rest of their lives, but unfortunately it did not work out," he told Radio 5 live. "I'm sorry to see him go. It was a tricky job, but Manchester United must have success and win things." Asked if there were similarities with his own situation at Manchester United, McGuinness added: "That's right, but it didn't work and several others found that out as well." Despite United's current troubles, club officials believe they can regain ground quickly. "Reports of our demise have been greatly exaggerated," one club source told BBC Sport. The finance is certainly available to strengthen the squad, as it would have been had Moyes remained in charge. United are also convinced their absence from the Champions League need not be too much of a handicap in the recruitment process. But Lineker believes the players need to improve their attitude. "There is no question the players let David Moyes down," said the former Barcelona, Everton, Tottenham and Leicester striker. "I hear pretty much first-hand that some of the players were pretty dismissive of the new regime. That is poor professionalism. "Some of them have probably made life quite difficult for David Moyes."